Fresh Tech Maid, a Chicago-based home cleaning service, is delighted to present their “healthy home giveaway.” Three lucky winners of this giveaway will receive a custom healthy home cleaning kit, the same one that Fresh Tech Maid’s professional and certified cleaning technicians use every day to make homes sparkle! This kit is designed to reduce cleaning chemicals by at least 95% for regular maintenance cleanings, so your home is cleaner, healthier, and safer for adults, kids, pet, and the Earth. This cleaning kit includes three varieties of microfiber cleaning cloths (green for the bathroom, red for the kitchen, and blue for general surfaces) to prevent cross-contamination, along with special agitation tools for an extra deep clean (scraper, whisk broom, sponges, microfiber mop cover, and a cleaning “toothbrush”). These cleaning implements can be used on any surface in the home. The healthy home cleaning kit also includes one bottle of Fresh Tech Maids’ personal brand of de-ionized water to promote safe, chemical-free cleaning. De-ionized water is H2O in its purest form, making it an eco-friendly yet powerful solvent suited to all cleaning needs. It is the most effective, chemical-free general cleaner you will ever find! In addition to a bottle of DI water, the healthy home kit includes a multi-purpose, eco-friendly cleaner, formulated to handle everyday cleaning tasks, as well as heavy-duty challenges. This non-VOC, bio-degradable product is something our Fresh Tech Maid technicians use every day for a safe and powerful clean. For added convenience, the kit also includes a multi-pocket apron to carry the cleaning tools with ease. The value of the kit is $80. The giveaway runs from Monday, September 18 through Sunday, October 22. 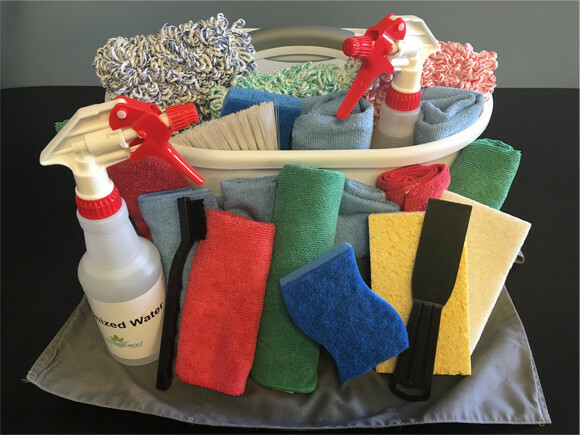 Wells Ye and the team at Fresh Tech Maid hope this kit will help families enjoy a clean, healthy, and chemical-free home! Visit https://freshtechmaids.com/healthy-home-giveaway/ to enter the giveaway, which ends Sunday, October 22, 2017. Fresh Tech Maid is a leader in cleaner and healthier chemical free house cleaning in Chicago and northwest suburbs. Located in Chicago, Evanston, and Arlington Heights, IL, Fresh Tech Maid has been designated as the “Best Pick of Maid Service” in Chicago and its northwest suburbs by the Best Pick Report the 7th time. Visit FreshTechMaids.com or just call (847) 392-0888.